Ultra High Purity Alumina is an exceptional material for electrical insulation or isolation requirements, particularly compared with currently used conventional ceramics such as steatite and porcelain. Ultra High Purity Alumina is also suitable for higher temperature applications and generally has a limit of operation up to 1600°C. This, coupled with a high corrosion resistance makes it ideal for insulators, particularly those found in electrostatic precipitators which usually have operating conditions of high temperature, humidity and acid or alkaline conditions. 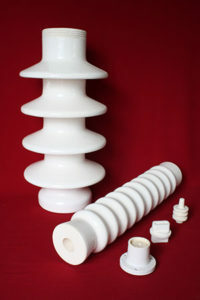 Taylor Ceramic Engineering can supply insulators glazed or unglazed as required, although unlike conventional insulating ceramics, Ultra High Purity Alumina is not porous, making the glaze requirement of the insulator virtually redundant. 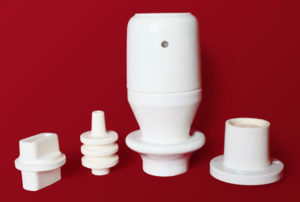 Insulators can also be supplied fitted into a housing or flange and as an assembly with any other metal components such as gaskets, bolts, nuts, or threaded shafts. Taylor Ceramic Engineering can also RETROFIT or REFURBISH flanges or housings from previously scrapped inferior insulators.